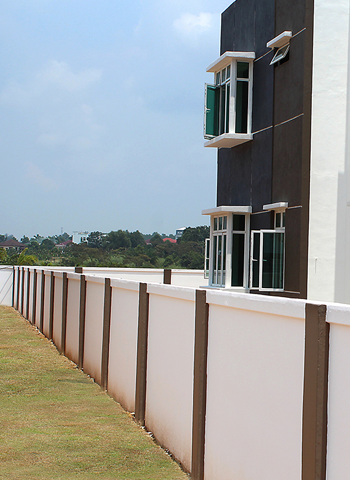 LSK Precast is a company established in year 2006 which is located at Masjid Tanah, Melaka. The company specializes in designing and manufacturing concrete forms of fence wall system in the precast concrete fencing market or industry. Although the company is established in year 2006, nevertheless, the company has more than 20 years experience while manufacturing the precast concrete roman pillar under the company name of RIA (Perniagaan Batu Ukir RIA). The company is currently producing a variety of roman pillar products which are vary in heights and designs. Furthermore, the company also produce concrete gate pillar, pillar stand, balustrade panels. Moreover, the company is able to fabricate variety of decorative art work such as window, door cornices and more than 200 design products which will enhances the aesthetic value of the residential area with the use of GFRC solution (Glass Fibre Reinforced Concrete). The company’s precast concrete fence products have become a staple in designing fences as the products are versatile and can be replicated into many natural patterns. In addition, these products have been manufactured and registered under Patent Malaysia. Lastly, the company is well equipped with a team of well trained and experienced designers, engineers and workers which continue to find innovative precast to maintain a sincere pride of workmanship and a strong goal towards customer loyalty and satisfaction in order to achieve the aim of ‘QUALITY PRODUCTS, PROMPT DELIVERY AND EXCELLENT SERVICES’.